High-performing teams are essential to successful public administrators and their respective communities. I defended that thesis last month in this journal. 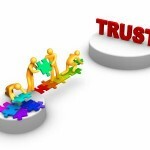 To achieve high administrative performance that is sustainable, interpersonal trust-based relationships are essential. The challenge for successful public administrators is creating space within government where trust resonates and flourishes. To accomplish such, I have outlined the necessary steps and elements below. But first, let us explore why does trust matter? Interpersonal trust, which I define as the perception team members have that other team members will not do anything to harm their interest, yields high levels of interdependence. Interdependence allows a team to work at higher levels of intimacy and functionality. When team intimacy and functionality increase, team members actively engage their individual and collective strengths, yielding high levels of team comfort and peace, thus permitting ideas to surface, germinate and blossom. As noted author and professor Barbara Fredrickson discovered in her revolutionary research on positive emotions, they broaden perspective while building in an exploratory manner. Interpersonal trust provides the space for positive emotions to resonate, broaden and build, ensuring that a climate for desirable outcomes exists. This climate provides safety for experimentation, learning to be encouraged and supported and creating shared knowledge for future application. This space is created, enabled and ensured by trustworthy public administrators employing the following six essential behaviors. 1. They give trust first. Before you can expect others to trust you, you must first trust them. This can be accomplished by enabling team members to make decisions. Those successful in accomplishing this usually provide a task to a team member, identify their desired outcomes and any other necessary task parameters, then allow the team member to achieve an outcome. No micro-managing occurs and the public administrator celebrates the achievement with the team. Again, clearly defining expected outcome characteristics at onset, then allowing the team member the latitude to perform without micro-management is essential. 2. They operate with self-awareness. They pay attention to the impact of their words and actions and manage themselves and their behaviors accordingly. They are not afraid to make visible ‘course corrections’ when and where necessary. 3. They are empathetic; they care about people. They are considerate and operate with compassion. They see others as individuals, not merely through their biases. They truly want the best for, and bring out the best in, others. 4. They are appreciative. They acknowledge and give genuine thanks for the efforts and contributions of others. 5. They see beyond self. It truly is not about them. They link the ‘why’ behind the manner and in a way that ensures others understand and embrace the true purpose. It’s not about their promotion or personal achievement; it is about the true purpose. 6. They manage direction and work, not people. They are not micro-managers. They ‘paint the picture’ of success, inform of parameters, clear hurdles, reduce unnecessary bureaucracy and enable success. They leave the excitement and fun in work by doing such. Yet nothing detailed above matters unless the foundation of trust is authentic. Authenticity serves as the glue that binds all that surrounds trust. Having had the privilege of working closely with public administrators, CEO’s and nongovernmental organizational leaders alike on the subject of building high-performance teams, I find some believe building trust is transactional with definitive beginning and end points, rather than evaluational experiences anchored in authenticity. They operate as if there are ‘magical steps’ to take where the final product or outcome is trust. This couldn’t be further from the truth. Remember, there is no speed to trust; rather speed is exemplified by trust. Authenticity is the glue that binds trusting experiences. To summarize, creating the space, an organizational culture, for trust to flourish is essential to building high-performance teams. Because performance is based on learning from mistakes and mistakes involve risk, creating a culture where risk is mitigated through trust is essential. While trust may be top of mind to the public administrator, attempts to create such a presence are fruitless unless anchored in authenticity. A public administrator can ‘talk the talk’ about trust. However, if that talk is not authentic and demonstrated with intent, trust becomes but an academic exercise. Author: Matt Selker is a management consultant. His firm, located near Cleveland Ohio, is hired by public and private organizations striving for improved performance through their human capital. Mr. Selker holds a bachelor’s degree in business administration from Edinboro University of PA, a master’s degree in public administration from Cleveland State University-Levine College of Public Affairs and gained his education in organizational development and change from Case Western Reserve University-Weatherhead School of Management. He can be reached via email at [email protected]. You do get what you give. I couldn’t agree with you more Tom. Nice article – true in private and public sectors – you get what you give!